Over the weekend, Pressley came out to work with the animals. Rich had set up a small obstacle course similar to the one that they will be encountering at the fair. We have made sure that Leezza and Mango had frequent experiences walking in and around various obstacles. We have walked them through the barn and attached wood shop, dodging tractors and power tools. During one of our recent parties in the barn, they even walked through the crowd in the barn, circling around the tables. Throughout all of this training it seemed as if Mango would be the one Pressley would be showing at the fair because she was the most cooperative. After he session this weekend we might have to reverse that decision. Mango was reluctant to walk over the low set bar or across the ramp. In fact, when Pressley tried to show her who was the boss and tugged at her rope, Mango kushed and refused to get up. When Rich tried to lift her hind quarters, Mango went limp. Impossible to move! Leezza, however, followed me obediently around the course and stepped daintily over the bar and walked across the training board that was flat on the ground. She even walked up the ramp...once. When Pressley took over Leezza's lead, she even got her to climb to the top of the little rock pile behind the barn. I had to sweet talk and coax Mango to stand up and walk with me back into her pasture. Tonight Rich and I took both girls out again on the lead and walked them around the yard. At first Mango was not going to leave the pasture. Then, when she saw her friend, Leezza, walking out of the gate and into the yard, Mango decided to follow. During this evening's session, Rich and I got both girls to step over the bar. Neither would go up the ramp. I considered this to be a good session anyway since Mango didn't kush and refuse to cooperate. I think we've learned that with alpacas, pulling them and trying to force them to cooperate won't achieve our goal. They seem to react much better to sweet talk and praise. Recently, I made a flower gathering trug (basket) for a new friend, Rosalie. She is a gardening enthusiast and had been wanting a shallow basket for bringing in her cut flowers. 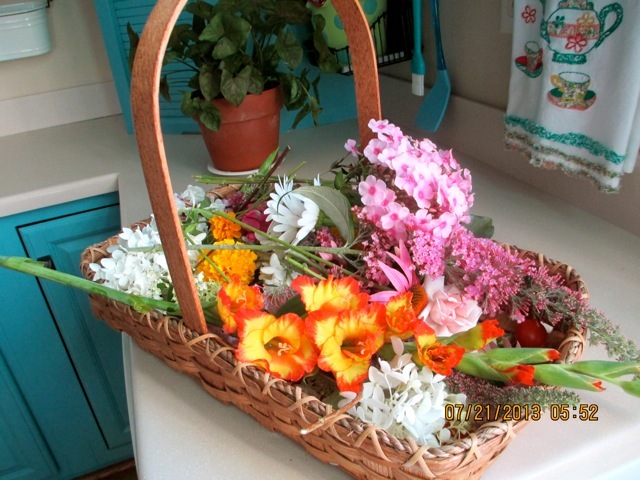 She kindly took a lovely picture of the flower-filled trug and sent it to me to post. In addition to being a good gardener she is obviously a very good photographer. Recently I reconnected through Facebook with an old friend that I hadn't seen for eighteen years. Since Donna lives across the continent for most of each year, only returning to our neck of the woods for the summers, we have been communicating through Facebook messages. It has been great to catch up with her and hear what her kids and grandkids have been up to. Today, since she is back east, we had a chance to meet for a leisurely lunch. It was so good to be able to talk face to face and we fell into an easy conversational mood just like old times when we were raising our kids. It made me realize how precious old friendships are and I intend to keep in touch. I will make it a point to meet up with her at least once each year when she comes back here. Facebook can be a wonderful thing.